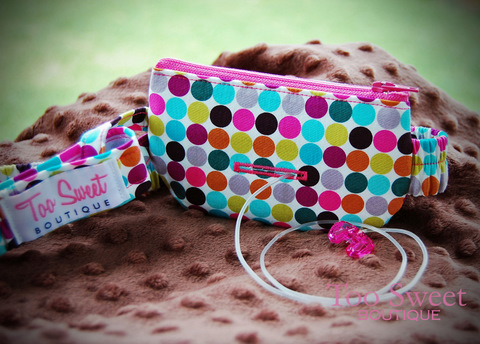 Too Sweet Pump Pouches can be made to hold most Insulin Pumps, Smartphone & Dexcom receivers. Many pouches are also available for Omnipod PDMs. This allows the PDM to stay on your child while they're out and about, so you/they can always control their Pod. Insulin Pump Pouches measure approximately 3"x5" and Omnipod PDM Pouches are 3.75"x5.75"
"Add On" Omnipod sized pouches can be used to carry glucose or even a mini meter & strips on your child. (if NOT holding a PDM) Add On Pouches can be removed from the belt as needed. If your child wears BOTH a Pump and a Dexcom you can Add On a removable pouch for the Dex G4. Add On Dexcom pouches match the insulin pump pouch you order. They have a loop on the back that slides on to the pump pouch belt, so you can remove it as needed. The Add On Pouch is also available to fit your Smartphone. You may like it for holding some sugars. Pouches feature a fabric covered, elastic waist band that is sewn into the sides so your pump lays flat against your body. Your child’s measurements are used to ensure a great fit! The belt has a Velcro closure with a 1" - 1 1/2" adjustment. NEW - A slide release buckle now available with a 2" adjustability. You can choose to ADD a Buttonhole to the back of your pouch. This allows pump tubing to exit the backside of the pouch and helps keep your tubing tucked away. You may select a placement of the buttonhole in the back of the pouch for either the center or on the side where the pump tubing is located. I use the latest designer fabrics and fun trims to keep my pouches fun and fashionable! No sliding, flopping, bulky pouches or scratchy belts! 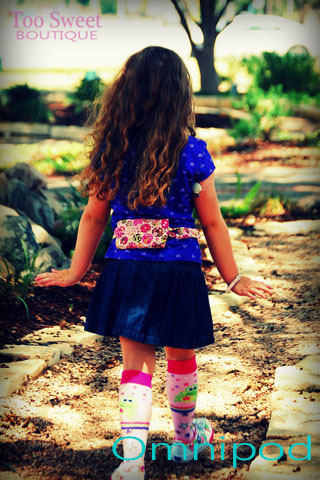 You can also choose to order a super soft minky belt for extra comfort. Too Sweet products are carefully handmade from the highest quality quilting fabrics and notions. I use zippers to close all of my pouches because they are secure and open QUIETly, day and night.